"It's great that big blues is back and this band should step to the front. Pinetop will be proud, give JJ his due"
"Enjoyable combo of New Orleans R&B, West Coast swing and slow blues. Johnnie is wonderful. Great band." "It's a great CD & I've been playing it for weeks." "Excellent album! One of the best new releases here." This 3rd RJ album redefines their diverse American roots R&B from a solid blues core, collaborating with Johnnie Johnson on seven cuts, who writes three of them, including the sublime moodiness of "Johnnie's Idea" and the classic stroll of "Slow Drag". It also features a cameo by east coast R&B diva, Rahni Raines, and the full New Orleans-style horn section that the band features at their Mardi Gras Mambofest performances: Rob Sudduth (tenor sax - Huey Lewis, Amos Garrett), Ed Early (trombone - Albert King), and Michael Peloquin (bari sax). With six other originals mostly by lead vocalist/bassist Tim Eschliman (Commander Cody, Etta James), an Irma Thomas classic, a New Orleans brass band romp and a Pinetop Smith Boogie Woogie, a full pallette of top shelf rhythm & blues is delivered on this recording - topped off by drummer Jimmy Sanchez's crazed full-bore second line deviation, "Mighty Fine Day." Rhythmtown-Jive - "this American roots combo is comprised of talented San Francisco Bay Area musicians who know how to raise the energy level on the dance floor....some jump blues, a boogie woogie, and a hefty dose of New Orleans style music, with refreshing, not rehashed, arrangements"..."a group to be reckoned with, polished sidemen all around..." having also back such greats as Bo Diddley, Earl King, Lee Allen, and Big Joe Turner. You can order RJ albums right now at our Order Music Now Page. We have added some Radio DJ comments as well as a known airplay list for "On The Main Stem. There is a list of Upcoming Live Dates on our RJ Live Page. Reviews of "On The Main Stem" as well as the first two albums, "Analog Travelog" and "Retrogroove Artifact", are available. 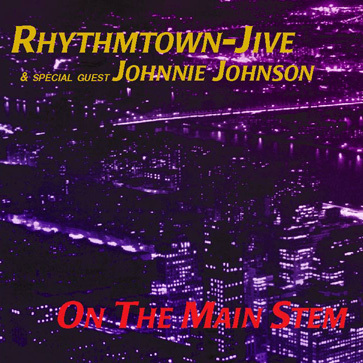 We have a list of records stores known to carry Rhythmtown-Jive albums.